Late night, very early morning. Mrs. E.’s friends are theatre people. Theatre people without toddlers. Which means that last night’s dinner lasted until the witching hour. The children, as is their habit, awakened around 6:30 am. My mother-in-law dropped by at 9:00 and since she hadn’t had breakfast and neither had we, I whipped up a very easy Tortilla Espagñola. After all, last night’s dinner was Greek bar food (Mrs. E.’s moussaka! ), so Spanish bar food seemed a logical choice. Begin by chopping up 1/4 of an onion, 1/4 of a red pepper and a clove of garlic. Sauté this in about two tablespoons of olive oil. Add salt. 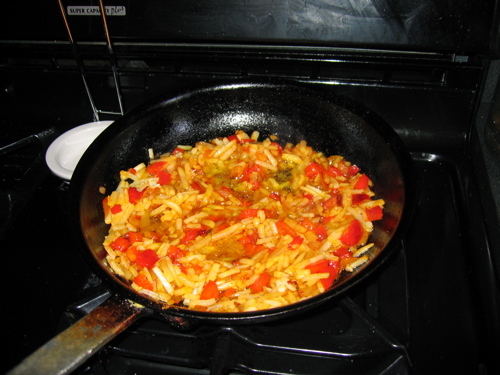 Cook for about 2 minutes, which is enough time to grab the bag of hash browns from the freezer and add about a cup to the skillet. Or you may julienne a small potato (peeled.) Add salt. Stir. If the mixture starts to stick, scrape it up with a metal spoon — and add a dash more oil. While that’s cooking, beat four eggs and some salt in a medium bowl. When the potato mix looks ready (the potatoes are a bit browned), add it to the bowl full of eggs and stir. Scrape up any browned bits from the skillet and discard or add to the egg mix in the bowl. Add another few tablespoons of olive oil to the skillet and heat it up. Pour in the egg-potato-onion-pepper mix. Cook over medium high heat, loosening the edges with a spatula and letting the uncooked egg slide under the omelette. When the whole thing is just about set, take a large plate and cover the skillet. Grab the handle of the skillet at the half-way point with one hand, place the other hand on the plate and (OVER THE KITCHEN SINK), with a quick flip of the wrist, invert the omelette onto the plate. Slide the whole thing back into the skillet and finish cooking. It will be ready in about two minutes. Thanks to all that oil, it should slide out onto a plate very easily. Garnish with chopped parsley and pimientos del piquillo . The dish may be served warm or at room temperature. Cut into triangles and serve. also makes a very good lunch or light dinner when accompanied by a green salad. 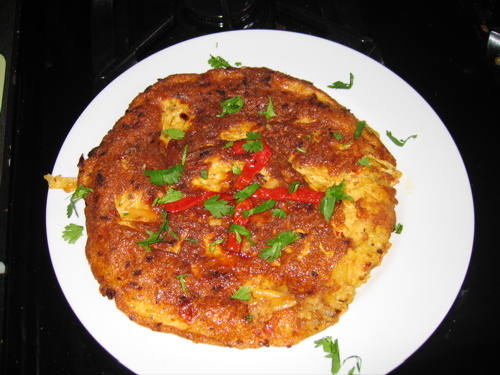 This entry was posted in Entertaining and tagged Breakfast recipes, Tortilla Espagñola. Bookmark the permalink. Ok, it is not fair to post things like this when I am stuck sitting in an airport!!! I am suddenly very hungry. That looked so good I stopped what I was doing and made it. Fabulous, thank you sir. I wish I had been this inspired today – it looks delicious. Can’t wait to make this – thanks for the tip about keeping hash browns in the freezer. May I ask, what kind of skillet is that you’re using? And would Mrs. E. be willing to share her moussaka recipe, too? That looks delicious, and I’m glad I caught your last comment because I would have tried it in the cast iron skillet! It is always interesting to have house guests who are not in the same stage of parenthood (if they are parents at all) as you are, isn’t it? Have a great weekend! Nice way to adapt the recipe for American cooks! 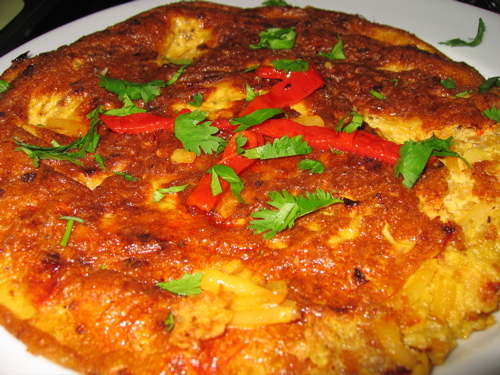 A Basque friend of mine used to use a bag of frozen potatoes O’Brien to make tortilla de patata, but your recipe sounds fresher and tastier. Enjoy the beach! That loveable ol’ Innigo. I posted about his latest book of poems when I first started! Hope things are well in Spain.